2) Murder Clown & Psycho Clown vs Hijo del Fantasma & Texano Jr.
4) Angélico, Jack Evans, Rey Mysterio Jr. vs Joe Lider, Myzteziz, Pentagón Jr. This didn’t appear to be a TV taping when they explained it at the press conference, but the poster says TV taping. It’s better than the Hard Rock show not being split into two tapings, but it’s also a couple of shows where not a lot will be happening. The Hard Rock lineup seems like the better one of the two; every match has at least one person who needs to be worked around. 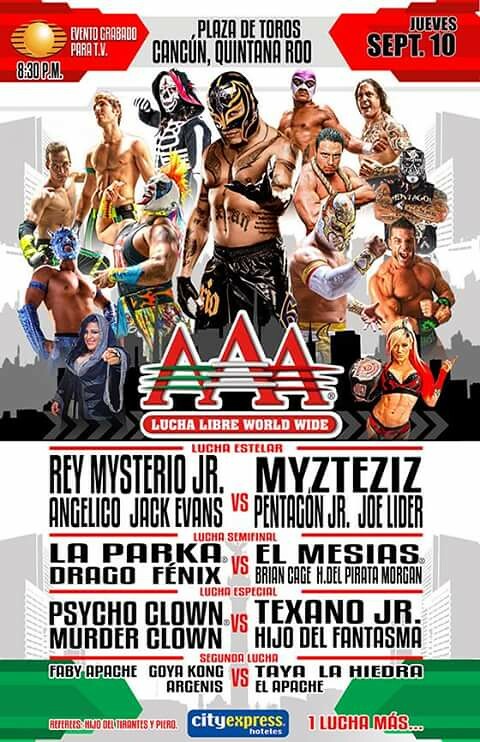 The good news is, after a period where nothing much was going on with AAA, we’re in a period where there’s 3 tapings in 10 days and new matches airing on TV this weekend. Much more interesting.